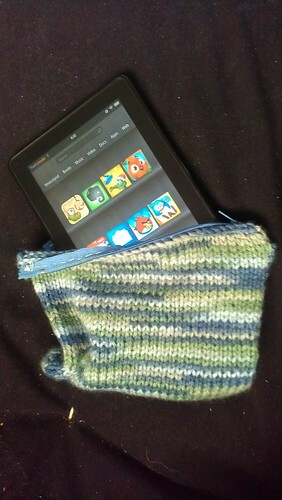 This will look noticeably shorter than the 7" height of the Kindle Fire, but I preferred my case to have a snug fit. 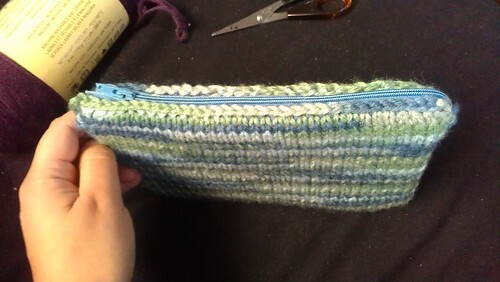 If you prefer it looser, you can add some stitches here. Repeat 1 and 2 until you've got something slightly more than double the width of your Kindle Fire. This was around 70 rows for me. Fold in half and sew up the sides. Put in the zipper on "top" and you're done! You can see in the photo below that my 7" zipper was actually a bit too small, so I had to leave a bit of extra space at the end so it was easy to get the Kindle in and out of the pouch. If you have a longer zipper, you won't need to do this. 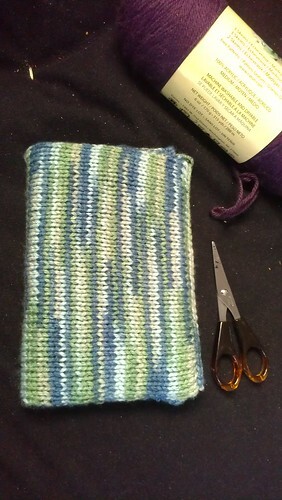 I learned to knit about a week before making this, so it's totally a suitable project for a beginner!